Mathey Dearman the end of January 2016. Charles and Associates, Inc. team. The new partners have experience Group was reappointed Secretary. sity and plans to take the CWI exam in representing numerous shipping in early 2016. As Torqeedo’s communications di- elected Margo Marks, President/Gen- ? ce in Quebec City, Quebec. 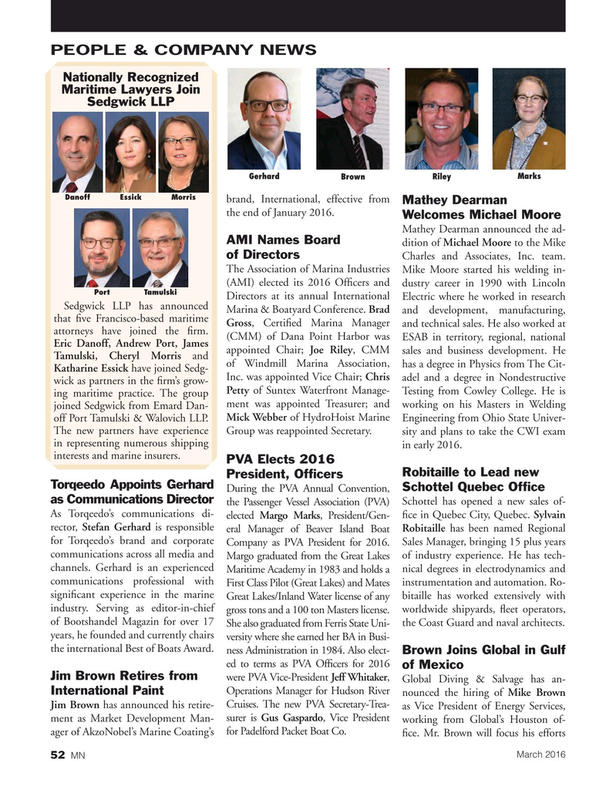 Sylvain rector, Stefan Gerhard is responsible eral Manager of Beaver Island Boat Robitaille has been named Regional for Torqeedo’s brand and corporate Company as PVA President for 2016. Sales Manager, bringing 15 plus years communications across all media and Margo graduated from the Great Lakes of industry experience. He has tech- channels. Gerhard is an experienced Maritime Academy in 1983 and holds a nical degrees in electrodynamics and communications professional with First Class Pilot (Great Lakes) and Mates instrumentation and automation. Ro- signi? cant experience in the marine Great Lakes/Inland Water license of any bitaille has worked extensively with industry. Serving as editor-in-chief gross tons and a 100 ton Masters license. worldwide shipyards, ? eet operators, of Bootshandel Magazin for over 17 She also graduated from Ferris State Uni- the Coast Guard and naval architects. years, he founded and currently chairs versity where she earned her BA in Busi- the international Best of Boats Award.